Contemporary Australia and notions of multiculturalism and diversity at times are hindered by concepts of dualities such as ‘majority, minority or white and black’.1 Complex issues of identity marginalization experienced by Indigenous Australians are often reduced to what has become known as Indigenous and non-Indigenous. The limitation of two distinct terminologies risks perpetuating a counterproductive duality evident in contemporary Australia. For many people heritage informs a sense of self and place in society, and in Australia this is apparent through notions of the frontier, the arrival of British invaders and their history of ideas. However, as is well-known, settler societies wreaked havoc for traditional owners and had a rich and persuasive mythology that included deeply ingrained views of racial marginalization. With regard to Australia, Marcia Langton asserted, ‘the challenge is to produce a new body of creative knowledge from Indigenous perspectives, Western traditions and from history’.3 Artists are taking on this challenge, making art about the world in which they live, everyday life, through the processes of exchange between people and places, and through the ‘consequent changes of meaning inherent within such transactions’.4 Art has the ability to provide us with new possibilities for thinking about identity and continuity as changing concepts in consideration of historical events, retaining cultural/spiritual traditions while engaging with the diversification of contemporary society. I often work collaboratively and, having an arts background, I approached several colleagues who regularly work with their heritage housed in museums about taking part in this article. The following discussion includes cultural heritage worker Lyndon Ormond-Parker and mixed media artists Christian Thompson, Brook Andrew, Maree Clarke, Brian McKinnon, Julie Gough and Desmond Raymond. Desmond Raymond is from Darwin in the Northern Territory and of Larrakia heritage. Larrakia is the name of the traditional owners, language, land and waters of the Darwin region. Museums around the world are facing challenges to move beyond the disenfranchisement of Indigenous people, and this resonated in Raymond’s words. Matters of cultural heritage preservation, access and reclamation have brought to the fore the importance of museum negotiation with the traditional owners of collections in their respective countries of heritage. Explicit engagement between Indigenous Australian inheritors of museum collections was perhaps made evident when the Natural History Museum advertised a fellowship for an Aboriginal and Torres Strait Islander to work and study at the Museum for a period of six months. The fellowship was situated in the Museum’s Human Remains Unit (HRU). The HRU conducts work associated with ‘requests for return of human remains to their community of origin’. Nicholas Serota, Director of Tate London, discussed how European artists have worked in the museum context since Surrealism in the early 1920s when he delivered the 1996 Walter Neurath Memorial Lecture. Serota speaks of how Surrealist artists ‘exposed and challenged some of the prevailing conditions by bringing together contemporary work with objects from earlier cultures’. Drawing our attention to the prevalence of European artists during the late 1960s Serota notes what Marcel Broodthaers called ‘the fiction of the museum’. Broodthaers proposed the ‘fiction of the museum as both a homage to and the parody of the traditional museum’.11 After giving a historical overview of artistic engagement with museums Serota considers site-specific artworks in the museum itself. He discusses the works of Richard Serra from the 1970s to 1992 as an example of how the ‘gallery or museum has become a studio, prompting a significant change in the conventional relationship between the artist, the work of art and the curator’.12 Such relationships are now made evident in the growing amount of art by artists who are the inheritors of museum collections, swinging our attention towards humanity and international relations. The subtle nuances of Christian Thompson’s photography and performance works engage with the diversity of social, cultural and historical contexts. They also highlight the plurality of empowered identity in an international arts context. A doctoral candidate at the Ruskin School of Art and Drawing, Oxford University, Thompson is of Bidjara heritage (from Central Western Queensland). While in Oxford Thompson conducts research at the Pitt Rivers Museum, sourcing aspects of his heritage in the most private manner, which may not be directly depicted in his images. Andrew delves into such unified interests of connection and contention via the receptiveness of his art, as demonstrated in Clown I and Clown II. The striking ‘zig-zag and diamond shapes’ covering the inflatable pieces are motifs from Andrew’s matriarchal Wiradjuri lineage from New South Wales. Andrew’s capacity to engage with the museum as a gallery extends artistic activities, as discussed by Nicholas Serota, by specifically advancing relations with the traditional inheritors of collections, privileging art as a form of social exchange. Homi Bhabha is well-known for foregrounding the idea that ‘artists negotiate systems of social exchange through material production’.18 For Andrew, the nuances of personal lineage and historical and contemporary ideologies are subtly transformed through the power of his art, as material production, into the realm of contemporary visual culture. The extension of the idea of artistic production into social engagement in recent decades was labelled ‘relational aesthetics’ by Nicolas Bourriaud, who advocated that art practices ‘take their theoretical and practical point of departure from human relations and their social context’.19 For Bourriaud relational implies interconnecting factors that comprise the lived experience, and the aesthetics of art make visible the social context in which works are made. It is not my intention to apply a particular model of aesthetics, but rather to consider how the visual components of art resulting from social exchange both reveal and interconnect context and meaning. 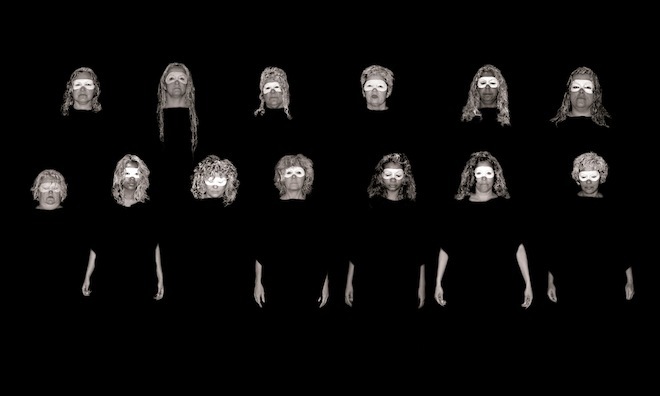 Kopi Aboriginal Women in Mourning signifies Indigenous Australian loss of family land, language and cultural practices, at the same time as it reasserts Indigenous continuity and self-determination. Clarke’s art exemplifies the concept of cultural continuity. The idea of continuity acknowledges the survival and adaptation of disenfranchised people which was central to the work and achievements of the late Professor Peter Ucko (1938–2007). Ucko suggests that the idea of ‘interpretation’ is informed through transference of history and the politics of land. In McKinnon’s painting Mungo Man, a powerful rendition of heritage and topical scientific debates draws our attention to continuity, resistance and survival. McKinnon’s painting was inspired by the unearthing of a skeleton named Mungo Man and the subsequent scientific conflict regarding the DNA findings from the fossil, estimated to be approximately 60,000 years old. Embracing contention, systemic in Australian history, to advance matters of equity in contemporary society is one way people may define a sense of self and community. As one participant in an edition of the ABC Radio programme Awaye put it: ‘Well, where do we begin with history? I guess the reality as Australians, whether we’re black, white or brindle, is that we do need to look at the past, warts and all, to understand how we got here.’31 Working together to redress history may not lead to resolution, but to disengage carries the risk of aggravating a state of irresolution and minimizing progressive action. All the artworks presented in this article are far more than an isolated activity of creating, perceiving and responding. The private immersive viewing of collections experienced by Christian Thompson results in photographic works emphasizing the plurality of empowered identity, while the provocative artworks of Brook Andrew transform the idea of a museum space into that of a gallery. Maree Clarke’s work responds to museum collections to redress an imposed discontinuity with the reality of continuity; her images enrich understanding of black iconography in popular culture, in the advancement of ideas about race, identity and empowerment. While Brian McKinnon’s paintings deal with heritage, resistance and survival combined with scientific contention, and Julie Gough’s work directly sources particular historical events as a way to exhibit living stories of identity and continuity. The artworks presented are examples of versatile and innovative exchange. They draw our attention to society as a networked and constantly changing process, and offer new possibilities of negotiation. From the most dispassionate, disconnected viewer to the most informed viewer, museums and galleries, as public spaces, continue to provide the public with the opportunity to learn more. One way to learn more of the dynamics of contemporary society is to look at the way they are resolved into artworks such as those discussed in this paper. Interpretive artworks are not a ‘copy’ of a deeper societal structure, nor are they a formal grammar of visual signs to do with one culture or another. Art is transformative, it is made new by encapsulating different sites of knowledge. Works presented here transcend the detrimental entrapment of identity marginalization that often hinders national discourse with a vision that proposes positive engagement with popular culture and empowerment. The artworks presented by Christian Thompson, Brook Andrew, Maree Clarke, Brian McKinnon and Julie Gough demonstrate that it is possible to move beyond histories steeped in conflict and contention towards new practical reconciliation initiatives between individuals, institutions, museums and curators. 9 Cressida Fforde, Gary Pippin and Lyndon Ormond-Parker are working on the eMob project. See http://web.archive.org/web/20090419155220/http://www.emob.org.au/. 16 Marcia Langton et al, ‘Brook Andrew Theme Park’, http://www.readings.com.au/product/9789081351614/langton-marcia-et-al-brook-andrew-theme-park. 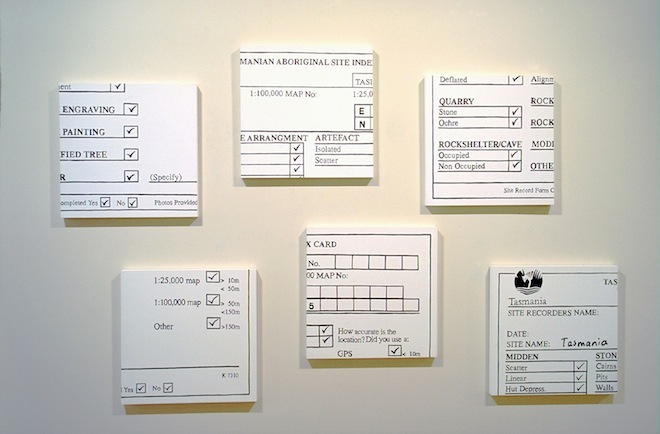 The work was open to the public at the Aboriginal Art Museum, Utrecht, Netherlands, 16 October 2008 – March 2009. Emma Barrow has worked collaboratively with people in Europe and Australia for over a decade. She has extensive experience designing and managing interdisciplinary projects foregrounding culturally inclusive initiatives. She works at RMIT University, Melbourne, across Indigenous Post education, is a member of the Design and Social Context College Human Ethics Advisory Network and the Aboriginal and Torres Strait Islander Education and Research Advisory Committee, and works as a lecturer in the School of Art at RMIT University.